We know that too much sugar is bad for our health. But swapping to artificial sweeteners creates more problems than it solves for our health. Just taking Aspartame as an example, this additive is responsible for 75% of the FDA’s recorded adverse reactions to foods. But are there any safe ways to sweeten our foods? In this week’s video I show you not only the dangers of artificial and even so-called ‘natural’ sweeteners, I show you my favourite, natural alternatives. And below the video you will find a recipe for my all-time best natural sweetener, containing just two raw ingredients. Trust me, it will satisfy your sweet tooth without the adverse effects of sugars, artificial sweeteners and processed products on the market. Dates are packed with nutrition and healthy fibre, as well as imparting a rich sweetness to many foods. 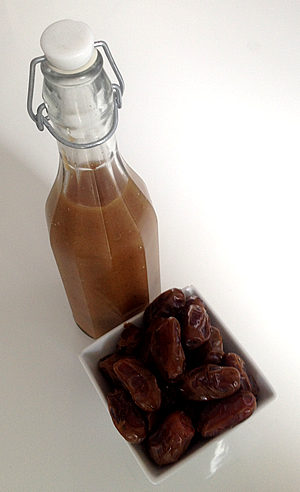 Making your own date syrup is super-easy and avoids any processing or pasteurising involved with shop-bought varieties. This recipe will keep in the fridge for up to two weeks… but I bet you find so many ways to use it instead of sugar that it won’t last that long! Rinse the dates and place in a large bowl and cover with water so they are all submerged. Once sufficiently plump from soaking, pinch the stone out of each date and place them in a jug blender or a jug if you are using a hand blender. DO NOT DISCARD THE SOAKING WATER! Instead, add about half to the dates and then blend. Add the remaining water and extra if required to achieve your ideal consistency. You can keep the consistency quite thick to keep the sweetness more intense, or more liquid, it’s up to you. Decant into a sterilised jar or bottle and keep in the fridge. Use this marvellous concoction to sweeten smoothies, juices, hot drinks, porridges and baked goods. 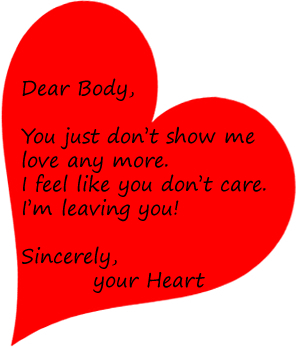 If your heart could write you a letter this Valentine’s, would it be loving or leaving you? Many of us take our heart for granted. Like any long term relationship, it’s easy to become complacent. We forget to appreciate our heart and how much it does for us day in, day out. We may neglect its needs, take more than we give back and not consider what would happen if one day it decided it was fed up of being treated that way! It feels our stress so it beats really fast sometimes and makes us panic. It’s struggling to cope with our food and lifestyle choices so it raises our blood pressure. It feels overworked and clogged up and so we feel breathless and lacking energy. Or maybe we could spend a little time with our loyal and loving heart and reap the benefits? On the day dedicated to all things heart-shaped, how about showing your real heart some love? Here is a quick and easy way to show your heart some real love this Valentine’s, and I guarantee your heart will love you right back for it! Beets – contain Betaine, a key nutrient for regulating inflammation and homocysteine levels in the cardio vascular system. 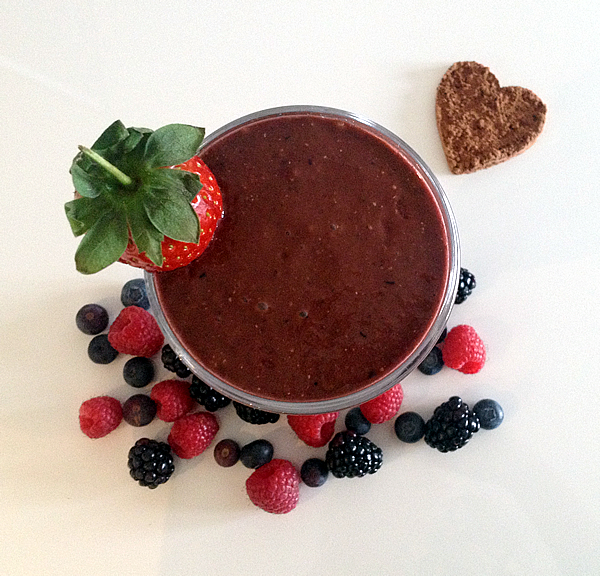 Dark-skinned Berries – Your body loves the antioxidants and polyphenols that berries are rich in. Your heart will love how these regulate blood pressure and cholesterol, making its job of pumping that good stuff around so much easier. Spinach – Packed with antioxidant vitamins and minerals, spinach is a strong ally in preventing oxidative conditions of the blood vessels and arteries such as atherosclerosis and high blood pressure. It also contains certain peptides that can help lower blood pressure by inhibiting a specific, harmful enzyme (Angiotensin). Avocado – Think fat is bad for your heart? Think again! Research shows that inflammation, oxidation and even healthy cholesterol levels are all improved by consuming avocados. Their essential fatty acids are, well, essential for heart health. Chia Seeds – Another rich, plant-based source of Omega3 fatty acids along with antioxidants and fibre to support healthy heart function. These little seeds pack a very big punch! Raw Cacao – The raw and unadulterated ingredient in chocolate is bursting with antioxidants, flavanols and minerals that can improve blood flow, reduce blood pressure and LDL cholesterol (that’s the bad type) and strengthen artery walls. Dates – These dried fruits are a great way to add sweetness without spiking your blood sugar. The high fibre content helps regulate both blood sugar and cholesterol levels, and their potassium can help lower blood pressure. Nut/Seed Milk – Choose an organic brand of your favourite nut or seed milk to thin out your smoothie and you will benefit from a plethora of nutrients such as polyunsaturated fats and vitamin that are essential for heart health. It’s also an easy way to reduce your dairy intake and increase nutrient diversity in your diet. If you have a jug blender, simply add all the ingredients with a little of your chosen milk. Pulse and blend until smooth, adding extra milk to your desired consistency. If you only have a hand/stick blender, you can still make this but it will take a little more effort to blend down. Chop the beetroot into small pieces to aid this process and add ingredients gradually if necessary. Even if you don’t have any heart health concerns, this recipe will show your body’s hardest working muscle just how much you appreciate it! And if you have any family history of heart, blood or cholesterol problems, this smoothie is delicious insurance against any future ills. So tell me, do you worry about your heart, appreciate it or never think about it? Will you be showing your heart some extra love this Valentine’s? Please like and share this article with anyone you know who may benefit and let’s spread some cardio love!